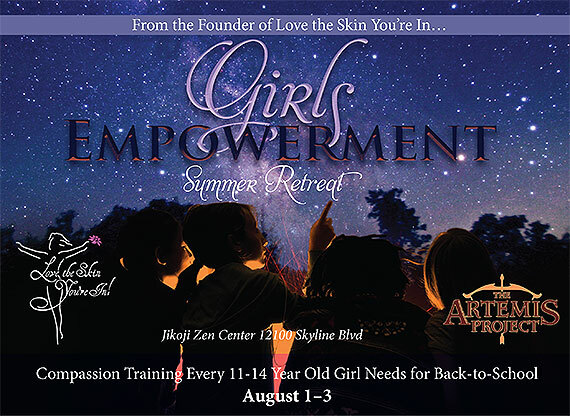 Our Summer empowerment retreats were born out of a desire to take the transformative experience of the Love the Skin You’re In assembly to a deeper level by inviting young women to come together to share their experiences, express their vulnerability, and find a way through girl culture in connection and solidarity. We are committed to a new relational model that celebrates one another’s strengths and cultivates resilience by embracing sisterhood. Our goal in every intensive is to empower girls with emotional intelligence training, communication and problem solving tools, wise mentorship, and loving, professional guidance as they transition from girls to women. We offer healthy activities in a safe environment where they feel loved, seen and appreciated. Transgendered children are welcome here. Programs are not intended to be therapy, nor substitute for psychiatric services. We are committed to providing a safe atmosphere where every girl encounters a feeling of belonging. Programming is offered in 2-hour blocks that move intuitively in response to group energy and dynamics. Organic meals, emotional and social intelligence curriculum, movement, mindfulness, tools for stress reduction and self care, and special guest teachers, foster whole-girl health and progression into thriving womanhood. 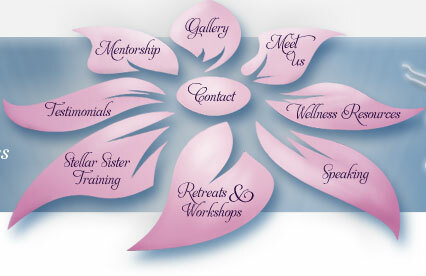 Our programming orbits around two central themes: stress management for self care and emotional intelligence training. Participants will be invited to an ongoing private Facebook group in which they can offer one another peer support in a safe atmosphere. We offer two back-to-school calls during the girls’ first month back to provide continuity, connection stability. Further one-on-one coaching can be arranged. Set into a beautiful nature preserve, our 25-acre retreat center offers a one-of-a-kind immersive environment that combines the best of simple accommodations and heartful contemplation within a woodland setting. A creek runs through the back, pooling into the tranquil Two-moon lake, nestled beneath the hills that rise up beyond it. This is Jikoji Zen Meditation Retreat Center and girls can expect to be woken up by the tinkling of breakfast bells ready for a new day. We were drawn to this space because of the strong energetic container it provides that naturally facilitates mindfulness of all aspects of living. The driveway in is a little bumpy, but when you arrive at the bottom, we promise you will feel enveloped by the serene vibe and vibrant wildlife. Located at 12100 Skyline Boulevard, 1.9 miles north of Hwy 9, 15 minutes above Saratoga. Sound Silicon Valley familiar? Yes, this is the spiritual home of Steve Jobs' Zen teacher, Kobun. Retreats begin at 2pm on Monday August 1st and end at 2 pm on Wednesday August 3rd. Please bring your own bedding. We are happy to accommodate dietary needs. Since graduating from McGill University in Women’s Studies and Humanistic Studies with Distinction, Brie has spoken to 70 000 teen girls worldwide with her multi-media event Love the Skin You’re In. Inspiring young women to find compassion within themselves and for one another, and to lead a new conversation about their bodies and beings, she conducts connective school-wide body image events about media literacy, mindfulness, and partnership. Brie speaks regularly at the Franchise for Humanity Conference at Stanford University’s Global Innovation Summit and has collaborated with National Youth Week New Zealand, Bay Area TEDx, University of Rochester Medical Center, Carmel Library Foundation, YWCA, and One Billion Rising. Her work has been featured in The Toronto Star, The San Jose Mercury News, and Coastal Living Magazine. Recently, Brie has spoken at Menlo School, Crystal Springs, Woodside Priory, Carmel High, Woodside High, Carmel Middle School, and Woodside Elementary School. Author of Freedom to Blossom, Brie wakes up in Muskoka, Ontario, Canada inspired by the teen social media activists that form her core team. Love the Skin You're In is a school-based assembly championing youth resiliency and mental health. Our school-wide events expose media misrepresentation and challenge youth to insist that their voices and imaginations be more valued than their looks and sexual behaviours. We inspire teens to value and practice positive self talk and see their power to choose connection rather than looks-based comparision, competition, slutshaming, sexting, and spectator bullying. Young people brand this talk as life-changing. Brie is excited to offer an experiential retreat experience for young women that acts as a progression out of her keynote presentation. Former Charter school Director, Kristen Rivers is a 25 year veteran educator and mother of three who has served hundreds of families and thousands of children throughout her career by providing mentorship and education with love. An accomplished Environmental Educator and Mentor, she combines her wisdom and experience to create inspiring programs for families and children, often leading wilderness experiences for 100 participants at a time. She began The Artemis Project out of a deep desire to address the most pressing issues facing teen girls today in a healthy and proactive way. 20 years of being on the cutting edge of education alternatives and child advocacy have ripened into a dynamic vision and voice. The Artemis Project serves a vital role in the global girls movement. We envision a world of healthy, empowered girls that grow up supported to become self-actualized women. Through mentorship, coaching, classes, after school programs, summer camps, and day-long empowerment intensives, we offer transformative experiences to hundreds of girls and young women. The Artemis Project brings applicable tools, skills and information to live an empowered and authentic life. A blend of soul searching, yoga, mindfulness practice, creative writing, dancing, hiking and sharing circles, Love the Skin You’re In™ retreats provide safe respite from the stresses of life. In small group or private settings, Brie offers girls and women a roadmap for cultivating sustainable relationship with their bodies, habits, and one another. Considering beliefs, attitudes, words and actions, her clients answer the call within them to courageously love and nourish their bodies toward realizing their highest potential, while opening their intelligence to include the lives of all beings. As a middle-way advocate Brie invokes the spirit of sisterhood to summon inner wisdom that fearlessly resides in each of us. She is here to relieve the part of our soul that yearns for love, to witness our personal exploration and reflect our inherent radiance – our ever-abiding companion amidst it all. Body Image Meets Embodiment is often engaged as an experiential progression out of the Love the Skin You’re In™ keynote address as participants embrace the potent medicine of mindfulness. An exploration of the joy to be found in direct sensory experience, this is a stress management for self care workshop that presents techniques for healthy living and positive relating. After opening and calming their minds and bodies through basic yoga and pranayama breathing exercises, participants are encouraged to disempower their negative ‘inner critic’ dialogue by attending to moment-to-moment sensations of the body. Composed and self-possessed, participants are now poised to learn skills for relating sustainably with self and others through emotional clearing techniques that honor feelings and affirm needs. Through a blend of insight, loving kindness and hip tunes, Brie offers Eastern antidotes for negative self talk, anxiety, depression and bullying. Her teachings are deeply restorative, profoundly stress releasing and cohesively community building – an invitation to surrender and shine.